When City & Guilds Group, a global leader in elearning and professional skills development, started to have connectivity and access issues with Office365 applications, delays started to impact productivity. 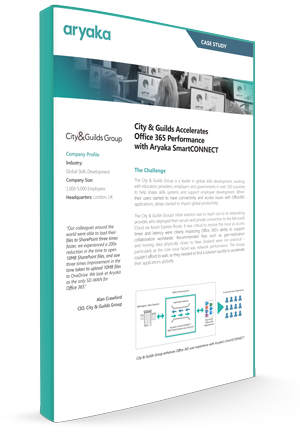 Learn how City & Guilds Group used Aryaka SmartCONNECT to deliver faster download times from their cloud services and enable real-time collaboration amongst all their global employees. How City & Guilds Group enabled global employees to access Office 365 from anywhere in the world. Why Aryaka SmartCONNECT provides faster and more consistent performance to Office 365 clouds located in remote geographies. How City & Guilds Group was able to deploy Aryaka in less than one day and see immediate application performance benefits.